I-70 runs along the northern edge of downtown Denver. Colorado DOT has been studying a critical section of the roadway for nearly 10 years, with a particular focus on the aging viaduct portion, built in 1964. 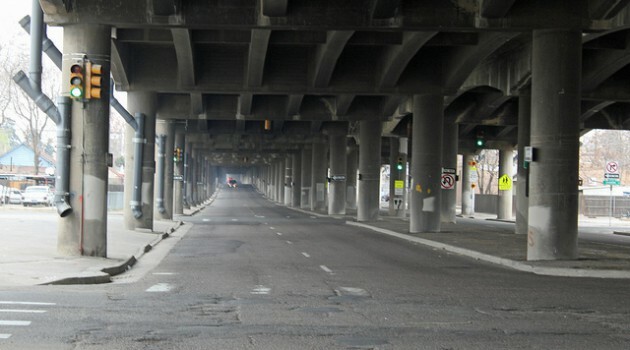 Last spring, the Colorado DOT proposed a plan to replace the viaduct with a depressed highway covered with a deck that could serve as a park or open space. Some community groups and residents are pushing for realignment of I-70 around the city, rerouting the traffic through the corridor currently occupied by I-270 and I-76 instead. Supporters for the rerouting alternative say that it will knit the street grid back together and spur economic development. But, Colorado DOT projects that this option will be much more costly than the depressed highway concept. Click here to learn more about the alternatives being discussed in Denver. Photo by Flickr user Jeffrey Beall via Creative Commons.